McLaren has announced that it has extended its contract with Fernando Alonso for the 2018 season. 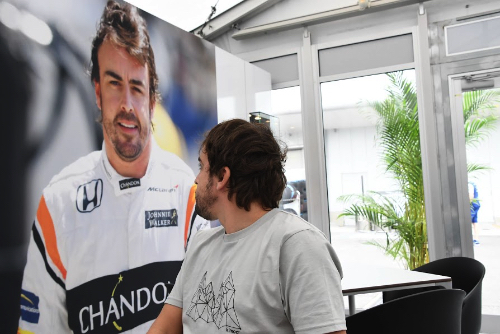 Fernando Alonso said, "It's fantastic to be able to continue my relationship with everybody at McLaren. It was always where my heart was telling me to stay, and I really feel at home here. This is a fantastic team, full of incredible people, with a warmth and friendliness that I've never experienced elsewhere in Formula 1. I'm incredibly happy to be racing here. Just as important, McLaren has the technical resource and financial strength to be able to very quickly win races and world championships in F1. Although the last few years have not been easy, we have never forgotten how to win, and I believe we can achieve that again soon. The last three years have given us the momentum to plan and build for the future, and I'm looking forward to that journey. I'm excited for our future together - and I'm already working hard to make it a success." Zak Brown, Executive Director, McLaren Technology Group said, "I'm delighted to be able to confirm that Fernando will remain at McLaren. He has been a fantastic asset to the whole organisation for the past three years, is an incredible individual and is one of the most accomplished and talented racing drivers of the modern era. It always made sense for us to continue our journey together. His commitment will allow us to further improve the attractiveness and potential of the wider Group, and will ensure we head into 2018 feeling increasingly confident that we'll be able to take a meaningful step forward. Fernando fully understands and buys in to the direction we are taking. Our shareholders have ambitious plans for the whole Group, and success within Formula 1 is a central pillar of that strategy. With Fernando, there is no doubt that we have a driver who can help us achieve our goal of winning again in F1 and, believe me, we are all keen to do that." Eric Boullier, McLaren Racing Director said, "With Fernando, you really can't ask for a better driver to deliver a result for you on a Sunday afternoon - and I think everybody in Formula 1 would acknowledge that sentiment. He's always been clear to me that this is a team he loves, and that his heart has always been set on staying. Today's announcement shows that he's fully committed to racing and winning as a McLaren driver, and, while we've often shared his frustrations over the past few years, we now feel that we can deliver on our promise to give him a competitive car next season. Consistency of driver line-up is one of those small but essential elements that really helps a team to maintain momentum, and, with Fernando and Stoffel, we're lucky to be writing a fresh chapter with what we believe to be the best driver line-up in Formula 1."